Here's something just about every MacBook user thought about in some way or another. Apple's signature glowing branding has ironically turned into a new platform for personalization as well as shameless re-branding. 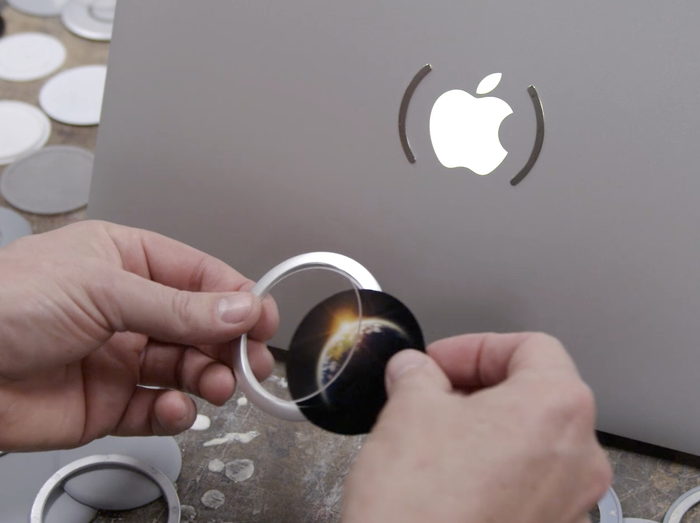 The Kickstarter product in question is called the Iconic Disc, which lets you easily customize that glowing Apple logo on the back of virtually any MacBook using a beautifully designed aluminum ring that magnetically fits over the Apple logo using harmless neodymium magnets, and with its clear acrylic lens, will essentially let you frame a personalized logo or any other graphic for that matter like the one above - which will of course glow instead of the Apple logo. The possibilities are endless. And all while the Iconic Disc beautifully matches with the bead-blasted aluminum finish of Apple's MacBooks. The Iconic Disc is interchangeable due to its magnetic attachment, so swapping between background graphics and colors is a cinch. To set it all up, you'll need to apply a pair of metal "landing pads" on either side of the Apple logo in order for the Iconic Disc to magnetically attach onto. These have a 3M adhesive backing that will not leave any residue on the lid of your MacBook. But there's a small caveat. The glow of the Apple logo will slightly be visible as a silhouette behind the graphic and will vary differently in its illuminated intensity from one design to another. Getting rid of it entirely isn't that easy is it. You'll have a ton of licensed images, textures and colors to pick from when ordering an Iconic Disc, including a choice of ring colors. The images are listed here. $25 will net you a DIY Iconic Disc in black or silver anodized colors, $30 includes your choice of an image, and if you'd like to send in your own image or graphic to be printed professionally for you, then $35 gets you the Iconic Disc Pro. But you could always print your own image using the provided template. Thanks for the tip, Kyle!